California's native flora is widely celebrated and renowned for its abundance and diversity which is largely due to our climate and varied geology, physiography and soils. 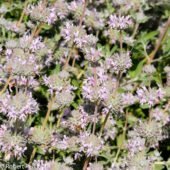 This list of plants includes over 100 popular California native species and cultivars that can be grown across the Inland Empire. Many of these plants are organized into garden styles and helpful lists to assist in making good planting choices for beautiful, water conserving gardens. As you review these plants it is important to remember: (1) The water needs of natives varies; some are adapted to low amounts of water while others do best with moderate moisture. (2) Native plants need care and maintenance. Mulching, weeding, seasonal pruning and replacement are important practices for any garden. (3) Most gardens have a variety of microclimate and moisture conditions as well as many sizes of spaces and activities. Creating a diverse planting palette is encouraged as a means to achieve both beauty and to find plants that fit soil, moisture and microclimate conditions. Height: 40 ft. - 80 ft. Width: 10 ft. - 20 ft. Height: 25 ft. - 50 ft. Width: 25 ft. - 35 ft. Height: 3 ft. - 5 ft. Width: 5 ft. - 7 ft.